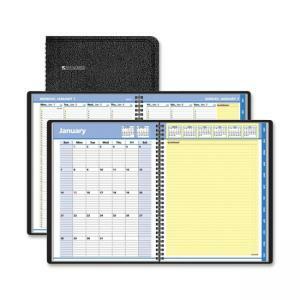 Media Size: 8.25" x 10.87"
QuickNotes weekly/monthly planner features two-page-per-week spreads with quarter-hourly appointment times from 8 AM to 8:45 PM listed vertically, including full weekends and QuickNotes column for notes. Two-page-per-month overview offers a full month on the left page, lined daily blocks, two past and six future months reference, and a full page QuickNotes area for planning. Planning pages range 12 months from January to December. Wirebound planner features black simulated leather cover and storage pocket. Pages are made with at least 30 percent post-consumer material. Nonrefillable.